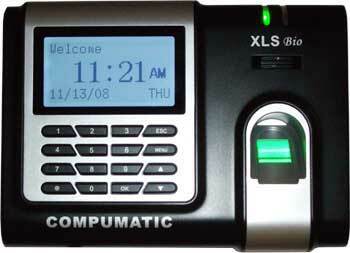 Compumatic XLS bio fingerprint time clocking system. 25 employees, upgradeable. RS232 and ethernet. Many useful reports, read more about it on this page. Includes Departments, Daily and weekly OT calculation, rounding, etc. Allows you to correct punches - missed punches, incorrect punches, etc. Reports include individual time card, department hours, report by clock site, etc. See the options above, for more of what is possible!